I think it’s safe to say that OPI nail polish is one of the best ‘go-to’ ranges around, yes? I never really owned anything from OPI, mainly because of the price tag, but I figured I needed to bite the bullet and order some nice polishes. Luckily for me, QVC had a fab deal on at the time, which offered quite a few gorgeous products for just over £30. Now, considering one nail polish comes in at around £10, and I got 4, plus a load of handcreams, Nail Envy and Avoplex cuticle oil, I'd say that was pretty amazing value for money. I did go for the offer purely for the Nail Envy and Avoplex oil if I'm honest (like I said, absolute bargain with the rest of it!) but I wasn’t overly sure about the offered colours, if I’m honest. I’m not much of a fan of red (says the girl with red hair) or gold, but I thought I’d give them the benefit of the doubt, and I’m very glad I did. I stupidly didn't take a photo before adding the Gold Shatter, but you still get the idea of what it looks like. And I needed to tidy it up BIG TIME. Malaga Wine is a deep crimson red shade, very glossy and shiny on your nails. Definitely more of an 'Autumn/Winter shade', so I doubt I'll wear this again for a while now (I need pastels in my life!) but that doesn't stop it from being such a gorgeous colour. 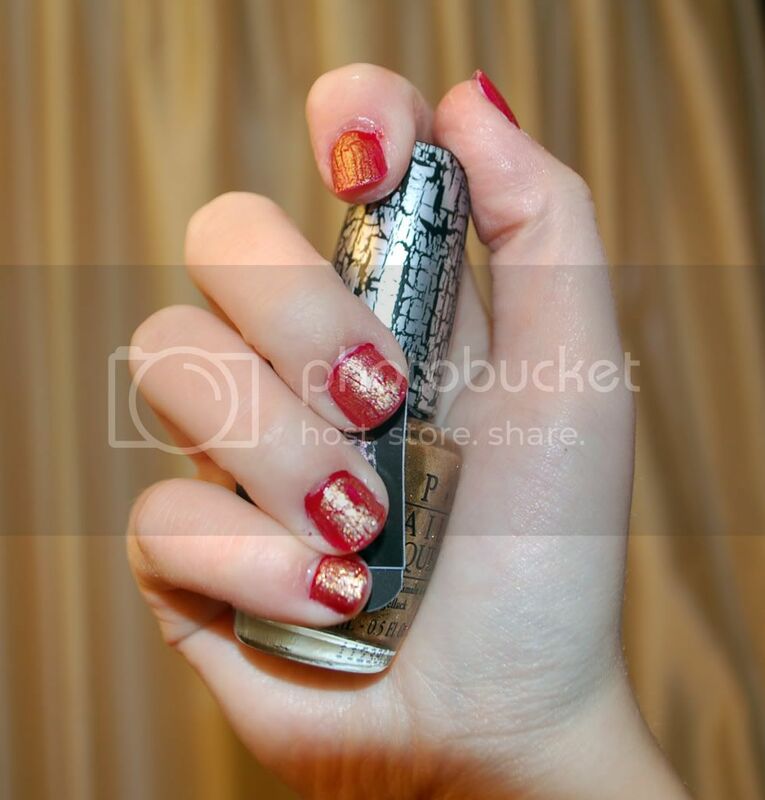 It was very easy to apply, and only need a couple of coats to be fully opaque on your nail. It's one of the best 'red' shades I've come across to be honest - it's just a classic go-to colour that goes with anything. I found that it actually gives off two different shades depending on lighting. The photos show a bright, vibrant red, but if the lighting is natural/darker, the colour is more deep. Decided to experiment the gold shatter on top, and I love it. I did mess up applying it, as it sort of ended up as one big blob on my fingernail, but some of them worked out pretty well! I blame the thickness of the polish (and the fact I was just rubbish at applying it). I never thought I’d like gold shatter but I do. It's such a strong gold shade, and sticks by its colour too - it really doesn't disappoint. Very striking and makes a great effect on your nails if you want to make a statement. Hopefully I'll make it work better next time... It probably needs a thinner coat so it creates a better cracked effect. 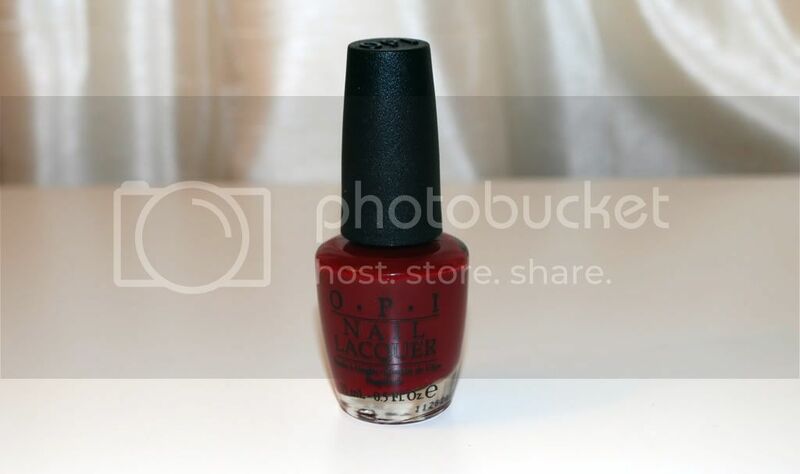 Do you have any trouble with OPI's Shatter polishes? What's your favourite OPI polish?